We’d love your help. 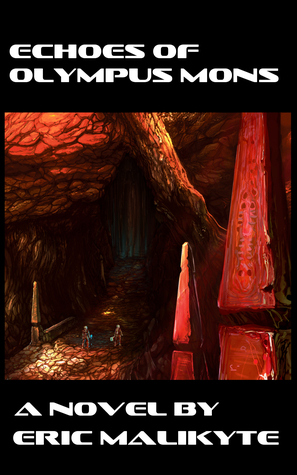 Let us know what’s wrong with this preview of Echoes of Olympus Mons by Eric Malikyte. Hal believes that the strange animalistic silhouettes hidden in the dark matter web prove his theories. The wiry, inhuman for Once they see you nowhere is safe. To ask other readers questions about Echoes of Olympus Mons, please sign up. I was lucky (hell, blessed might be a better word) to be on the advance street team for this book. This is an incredible book. The tension and action grips you by the throat and drags you through every chapter until you're finished. I could not put it down! I'm not going to give anything away because you need to be as stunned and done in by this story as I am. I have other books to review, but I can't do it yet; I'm still in awe of this one! A plunge into the abyss - do not miss this one! This review is based on the print version of the book, which I recommend. Somehow it makes perfect sense out of the little numbered sub-chapters within the actual chapters, whereas the e-version somehow confused me with this. As stories go, this falls somewhere between Pitch Black and Deep Horizon: the setting, the unseen entities, the individual who justifies and embraces the gruesome. If you’re squeamish about adult themes, steer clear. That said, A plunge into the abyss - do not miss this one! As stories go, this falls somewhere between Pitch Black and Deep Horizon: the setting, the unseen entities, the individual who justifies and embraces the gruesome. If you’re squeamish about adult themes, steer clear. That said, this is much more than just a horror story, and one which I found to be excellent. Yes, there is a little roughness around the edges: a couple awkward sentence structures, some incorrect punctuation. Additionally, it comes off a bit heavy-handed in that the couple openly religious characters are utterly insane about it. But don’t let that stop you from enjoying this ride! Like many of the greats, Malikyte’s ideas set him apart. Also, there are moments where the writing really shines, making me want to note the passage for future reference. The banter between Hal and Akio is great, and some of the colorful language makes one stop and consider things about the nature of humanity, but without distracting from the flow. The scenes with the more insane characters would translate wonderfully into film. Then there is the storytelling itself. On its surface this is a science fiction horror thriller, but what really drew me in were the explorations into metaphysics: ponderings about the nature of consciousness, of quantum nonlocality, of how little we truly know about the underlying fabric of the universe. In fact, the novel could be taken as metaphor, illustrating humanity’s inability to deal with things in appropriately intelligent ways. The lead character may be the only one with obvious layers, but he is very flawed and aware of that fact. At first, you’ll wonder why he’s so reckless, but that starts to become clear later, even as it becomes LESS clear, in brilliantly deliberate fashion. By the end, you, like Hal, are barely holding onto what is real, hoping that nightmares stay where they belong. The last few chapters didn’t go as I expected, and after some reflection, I feel the ending is perfect. Many novels start off with promise but collapse mid-way; this one does not let down. It kept me in suspense, excited to discover more; the whole of the story was very satisfying. When Paranormal meets science fiction Olympus Mons Happens. Most of the times, I need a certain number of pages, a few chapters before a book can capture my interest but not Echoes of Olympus Mons, I was hooked before I had even finished the second chapter and committed to seeing Hal and Akio through to their adventures, inventions and what comes of them. The book has everything, a teenager rising above his adverse past, a strong friendship, scientific minds and reasoning, life on another planet When Paranormal meets science fiction Olympus Mons Happens. The book has everything, a teenager rising above his adverse past, a strong friendship, scientific minds and reasoning, life on another planet and a decent dose of spooky and gruesome mysterious murders to keep the readers flipping the pages. It gets a little weird when the writer starts talking about non-local consciousness and uses out-of-body experiences to support it and it sure did make me apprehensive but still wanting to know how our writer, Eric Malikyte will connect dark matter and life on Mars to non-local consciousness, I read on and didn’t have to regret it. Everything is explained with plausible scientific reasoning. The detailed enough and not a tad too much description of the surroundings, character’s emotions, and experiences make it very easy for the reader to lose themselves in the book and make them feel like they are on Mars themselves standing on the periphery watching the scenes play out. Though I find Hal’s teeth gritting a little too much and the explanation for dark matter creature’s creation a little weak, the ending was just what I expected and more. The great ancient halls of Mars’ caves with the green lights felt a little cliched. Echoes of Olympus Mons starts as a sci-fi, progresses into sci-fi paranormal, takes a turn with murder mysteries and then has a very realistic ending. But I wonder is if Hal’s story will continue? If he will survive? Will the rest of people on Olympus One survive? Only our writer can tell. So, Mr. Writer what do you say, is there still hope for humans on Mars? This is a book that manages to engage the reader despite the self-imposed social isolation of the main protagonist and narrator. Other characters in the book are initially much easier to empathise with, but, as the story progresses, the reasons behind the narrator’s remote stance becomes clear, engendering sympathy and a deg It takes imagination and sound scientific knowledge to invent an entirely new form of monstrous antagonist in a science fiction novel, and Eric Malikyte has both in quantity. Anyway, like I said, the sci-fi genre is rife with possibilities for some good horror stories, especially ones that introduce a brand new kind of bad guy. That's why Eric Malikyte's Echoes of Olympus Mons was such a treat. It wasn't just that it was well-written with some suberb character development and a hefty dose of science, it was the fact that he came up with a monster that hasn't been done before. I won't spoil it by telling you, but it's a genuinely unique take on sci-fi horror. Malikyte Anyway, like I said, the sci-fi genre is rife with possibilities for some good horror stories, especially ones that introduce a brand new kind of bad guy. That's why Eric Malikyte's Echoes of Olympus Mons was such a treat. It wasn't just that it was well-written with some suberb character development and a hefty dose of science, it was the fact that he came up with a monster that hasn't been done before. I won't spoil it by telling you, but it's a genuinely unique take on sci-fi horror. Malikyte keeps you guessing throughout the book. Even though the action is spelled out, he leaves enough wiggle room to make you wonder if what's happening is really happening or not. He paints us solid, real characters who are far from perfect charicatures, and gives us a vision of Mars that shows a red planet that frankly doesn't give a rat's sweet patootie about us. I was lucky enough to get my hands on an advanced copy because I joined Eric Malikyte's Street team. Echoes of Olympus Mons is a 268 page science fiction thriller. The main character Hal is a recovering Catholic who self medicates with Alcohol, and is as arrogant as he is intelligent. The story is told through his point of view on his journey to self actualization. The many vivid surreal scenes kept me turning the pages. This book has lots of re-read value, but left me wanting a little more char I was lucky enough to get my hands on an advanced copy because I joined Eric Malikyte's Street team. The main character Hal is a recovering Catholic who self medicates with Alcohol, and is as arrogant as he is intelligent. The story is told through his point of view on his journey to self actualization. The many vivid surreal scenes kept me turning the pages. This book has lots of re-read value, but left me wanting a little more character development from secondary characters. It was definitely a good read and I recommend it to those who want a thrilling book that will lead them to self analyze. It called to mind some of the same feelings I had when reading Ender's Game. Which is one of my all time favorite Sci-Fi novels. I highly recommend it to those who enjoy books that are similar in nature. This was my first sci-fi read. I wasn’t sure if I would like it since it’s not my typical read and I am not big on sci-fi, but to my surprise I loved it! I could not put it down. I recommend it to everyone whether you’re into sci-fi or not, it’s definitely a great novel.